On our recent trip to Walt Disney World, our family went on Animal Kingdom's Wild Africa Trek. This 3-hour tour is described as offering "Guests the perfect opportunity to explore the Safi River Valley and discover animals of nearly every variety in an uninhibited, natural environment." My husband and I went on the Wild Africa Trek a few years ago, and wanted to experience it with our kids. We had two issues to overcome before we could schedule this experience: 1) Our youngest had to be 8 years old and 48 inches, and he had a birthday two weeks before our trip, and 2) Our oldest son has Autism and we had to make sure his anxiety would not impede him from completing the Trek. We scheduled our Wild Africa Trek for 8 a.m., so that we would have cooler morning temperatures, and have a better chance of seeing animals before they hide out from the hot sun. You must arrive 30 minutes early to check in with the Wild Africa Trek staff. Our Trek had 11 participants and two Tour Guides. Once the group arrived, we enjoyed a quiet walk through the Animal Kingdom, before the Park opened, to the Kilimanjaro Safari entrance. Here, were were weighed and fitted with safety gear, sound equipment, name tags and water bottles. Most guests were fitted with an earpiece, so that they can hear the Tour Guides throughout the Trek. My youngest son has Sensory Processing Disorder, and does not like to have things inside his ear. The Tour Guides were able to fit his audio equipment with headphones instead, making his experience much easier for him. Our first stop on the Trek was to the Hippo Pond. Here, our safety harnesses were attached to a metal structure that keeps us from falling off the edge of the cliff. We were able to walk to the edge and look down on the Hippos without fear of falling in. An Animal Specialist came to talk to us about Hippos, answer any questions we had, and feed them romaine lettuce. 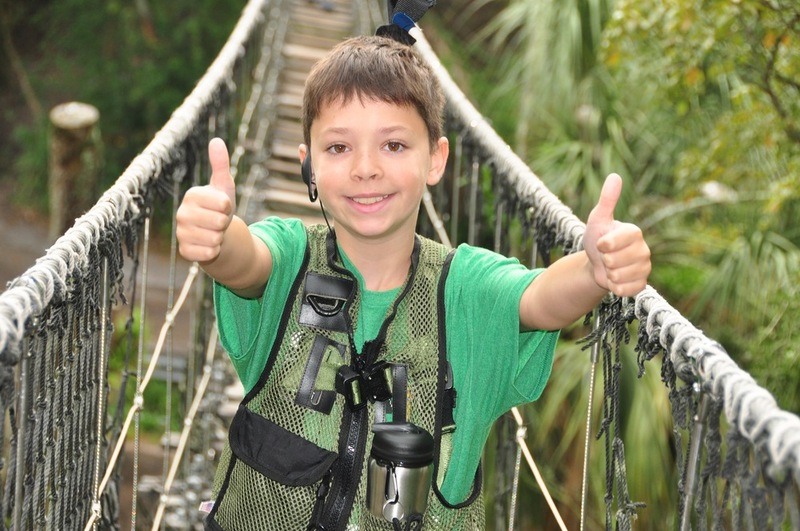 Our next adventure on the Wild Africa Trek was crossing the suspension bridges over the crocodile ponds. With the safety harnesses attached to a line above, guests can cross the suspensions bridges in complete safety. Even our youngest son was able to cross the bridge independently! Our oldest son has Autism, and we were concerned that his anxiety would get the better of him, and he would not be able to cross the bridge. We prepped him before our trip, and we watched many YouTube videos about the Wild Africa Trek beforehand, so he would know what to expect. We spoke with the Tour Guides ahead of time, and we had a contingency plan in place, just in case he got scared at the bridge and couldn't cross. But, I'm happy to say, he crossed without a problem. All of our pre-planning worked, and when I asked him if he was ready, he said, "Yeah, I got it, Mom." As you can see, there is a safety harness attached to a line above you, and a safety net below the bridge, so you can't fall through. Some of the bridge slats are missing, for dramatic effect. The suspension bridges go over the Crocodile ponds. We saw so many cool animals! Once you complete the suspension bridges, it's time for a snack! Guests are taken to a covered patio on the Savannah for a bite to eat. As morning safari guests, we enjoyed tiffins with snacks like air-dried beef and prosciutto, smoked salmon roulade with dill, fig cake with boursin cheese, brie cheese and apricot, berry yogurt and dried cranberries, and fresh fruit marinated in mint and ginger. Because of my son's Autism, he has a very limited food repertoire. He won't even try foods that are different from the foods he knows. I was able to speak with a Cast Member working with the Special Diets department and ask for alternative foods in his tiffin. All foods had to be cold, as they keep the tiffins chilled until the little savannah picnic. I was able to get him cold chicken tenders, a few pieces of cornbread, apple slices, grapes and chocolate chip cookies. After snack time, we were able to explore the savannah patio and the animals surrounding it. Guests were able to borrow the binoculars to see the animals up close. Our favorite was the big cats, who made an appearance! Despite having a few challenges with Autism and Sensory Processing Disorder, we were able to thoroughly enjoyed our Wild Africa Trek. it was the highlight of our Walt Disney World trip!